Every home or property owner can appreciate the beauty and class of excellent landscaping, but you surely don’t want anyone walking through your well-manicured grass! A popular choice in landscaping is a perfectly designed walkway for pedestrians to use while enjoying the greenery and gardens. At Ware Fencing, we specialize in all kinds of fence replacement, fence repair, and fence installation. However, we also have an extensive amount of experience in stonework. If you are interested in flagstone walkway installation in Crowley and Fort Worth, TX, we have great prices, and detailed craftsmanship too. To learn more, give us a call at 817-948-4503 and speak to one of our friendly associates, or keep reading for additional information! 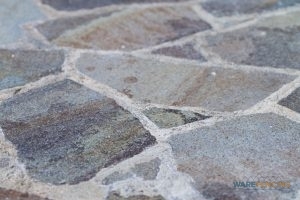 Flagstone walkways are a common sight in luxury homes and beautiful restaurants all over Crowley and Fort Worth, TX, but they are really more affordable than you might think. At Ware Fencing, we use only the highest quality materials to make sure your new walkway is not only stunning but also built to last. There are several different methods of installation that can be used with flagstone, but the most durable are created with a concrete base. This gives you all of the durability of a traditional concrete walkway, with the beautiful accent of flagstone in the color of your choosing. You can even tie your entire property together with matching stone fence columns accenting a wrought iron fence. We’re here to help make your vision a reality. Installing flagstone on your own is time-consuming, labor intensive, and fairly expensive, once you factor in the cost of the associated equipment. When you choose a professional flagstone walkway installation in Crowley and Fort Worth, TX from the experts at Ware Fencing, however, you can count on affordable pricing, fast work, and fantastic results. Our installers know a variety of flagstone walkway designs, and we are happy to help you choose the best designs and methods of installation for your garden or property. 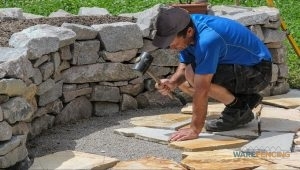 We also offer a variety of other helpful stone work services to clients! No matter what you’re looking for, we have the expertise to help, so give us a call today at 817-948-4503 to get started. Updated on September 20, 2018 at 9:00 am by Ware Fencing.